Cat shares her story of babywearing with talipes - "happy feet" - so that other parents whose children have the same condition can feel encouraged. If a child can be carried in arms, it is very likely they can be carried safely in a sling! I found out at my 20-week scan that my first child had bilateral talipes and would need to undergo the Ponseti method of correction. This is the most commonly used method of treating talipes these days, and is extremely effective if followed properly, but I was worried that it would mean I couldn’t carry my baby using carriers as I’d hoped to. Luckily, I found my local sling library while I was still pregnant and Rosie helped me find a suitable carrier for each stage of the process. 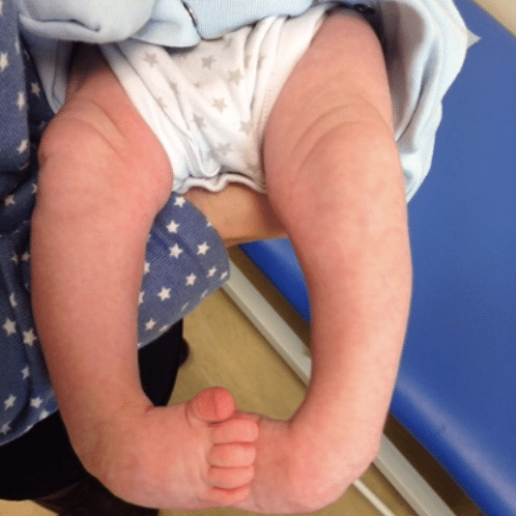 This is a 5-8 week period where your baby will be put in casts, which will be changed each week, and an experienced doctor will gently manipulate your child’s feet back into the correct position. On casting day we used the pram, while the casts dried. (It may help to cover your pram mattress in a towel, and add some support behind your baby’s knees with a rolled up towel to take their weight). Then from the next day we used a Storchenwiege meh dai and used the wide wrap straps to support the weight of the casts. I know other people who have made a stretchy wrap work. It can be a challenge to avoid the casts rubbing against tender skin and a well-placed carrier can help make this easier. 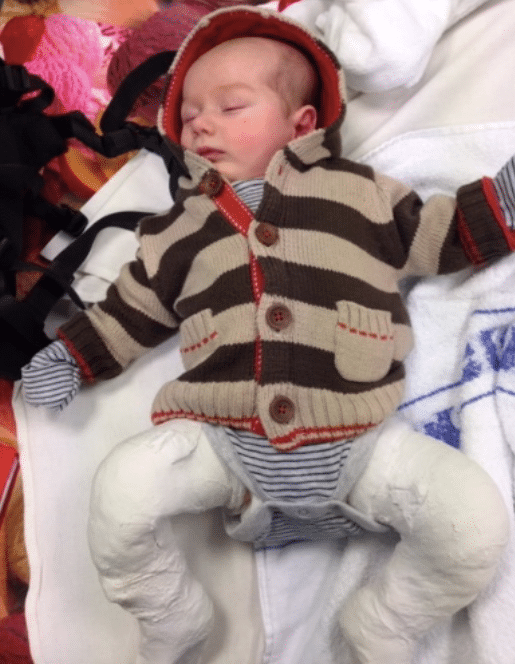 Once the casts are off your baby will be in boots and bars for 23 hours per day for a few months, allowing one hour per day for whatever you like. We usually used it for a shared bath to stay clean, warm up and have a really good cuddle, but you can use it for swimming, baby massage or one day we used it to put footprints on pottery! 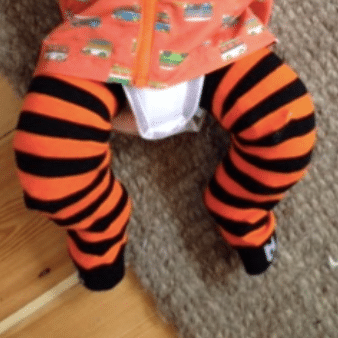 During this time you need a fairly narrow-based carrier because the baby’s legs are being held a set distance apart (their shoulder width) and they won’t be able to sit deep into a carrier with their knees up as you’d normally position a young baby. 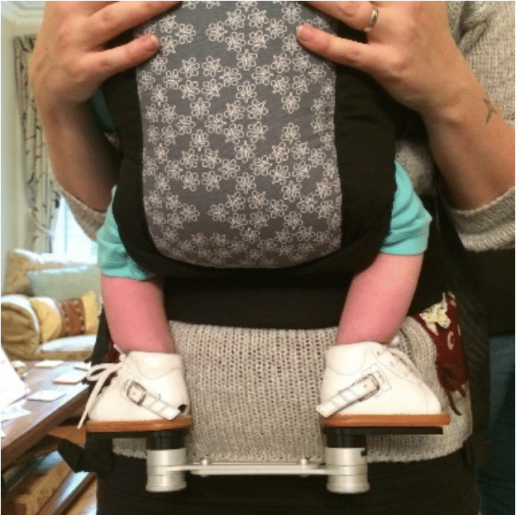 We loved our Beco Gemini buckle carrier, it was easy to use, I got the hang of the safety clips on the sides very quickly, and the base clips out wider once your baby grows and comes out of the daytime boots and bar. (Editor) There are many options that could work here. The panel needs to be able to be narrow, as explained above, and slim enough to be able to fit through the gap between baby’s legs and the bar. (Some bars unclick briefly, which can make it easier to get the body of the carrier into the space). Generally, flatter, less fitted panels will work better as it will be harder to make a seated J shape, due to how the bar rests against the parent’s body. Some options would be an Integra Baby Carrier which has an accessory strap for making the panel narrower to fit within the constraints of baby’s leg shaping, or a Mamaruga ZenSling/Isara Baby where the panel can be adjusted on the waistband to narrow down. The Beco 8 and Gemini ranges and the Izmi Baby work nicely too, as the panels fold inwards. Any good meh dai that adjusts at the base to control width would also be a possible solution. At about 6 months you will usually be told that you can take off the boots for most of the day. At this point you have the full range of carriers and wraps to choose from and your baby is probably ready to go on your back which helps with their increasing weight and means you can see more easily again! Front cuddles are obviously still lovely too at this point. I still used our buckles occasionally but at this point I fell in love with wrapping because of the colours, the comfort, and the fun of learning a new skill. I also learned how to use ring slings for the quick up-and-downs! I had to adjust my expectations of what carrier I would use but I was so thrilled that I could still carry him I really didn’t mind too much. Walking up stairs – their boots will bang on your thighs a bit, and sitting down will depend on the personality of your baby because as you sit their legs rest on your thighs. Mine did not approve of me sitting down unless I did it sneakily while he was asleep. My sister made a padded bar cover which eased the bumping on my hands and legs, as well as being a cheerful conversation starter on buses! They can get slightly chilly feet because how tight the boots are and how it makes their legs hang down (rather than tucked up in the J shape). This means they are not as snuggled into you as they might like to be. 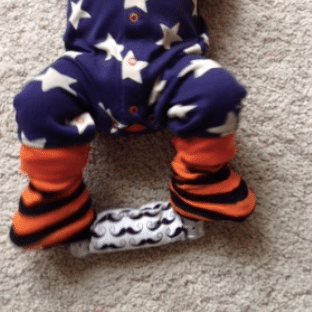 I got baby legwarmers and pulled them right down over his boots, which meant that I could still check his toes were warm. 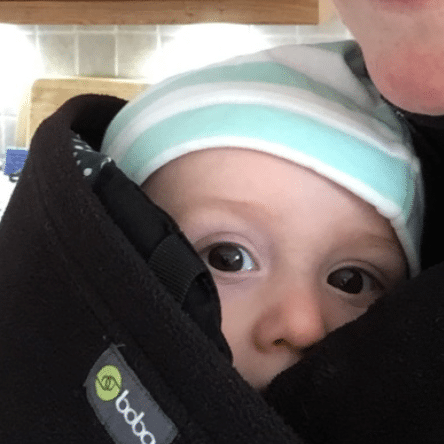 I’d recommend a giant zippy hoody to go around both of you or specially designed babywearing clothing such as the sleeveless Boba fleece. Does babywearing help when you have a baby with talipes? All babies react differently to the treatment, so every parent’s journey will be different. Looking back it was such a short period of time, but it was an extremely intense period, totally focused on doing the very best we could for him. We had a very sensitive baby and he found casting and his new boots very tricky to deal with (I know of other kids who have sailed through and even fallen asleep during casting!). The sling allowed me to hold him for the very long periods of time that he wanted comfort when he was distressed (which was frequent – he wanted holding all the time!) and also to take care of myself as best as possible. I was so grateful to have two hands free to make a cup of tea and a slice of toast. It helped us to feel like we were facing the tricky times together, and gave us closeness during difficult days when we were battling with equipment and procedures that overwhelmed us. 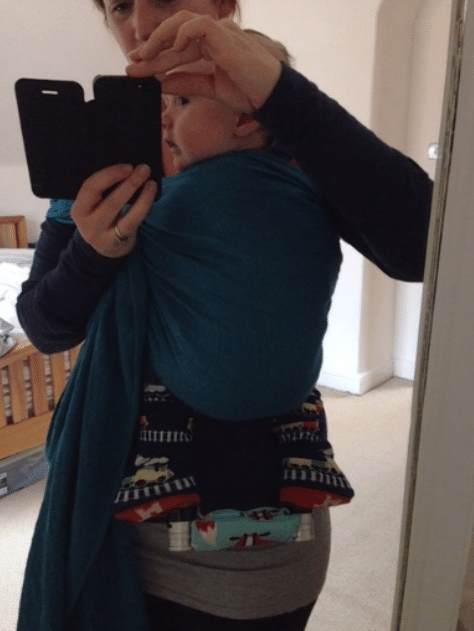 Babywearing allowed me to get out of the house which was so essential for my mental health. I also made amazing friends who have been an incredible support network over the years while I was finding my way in a new city. Improved mobility really saved me, I could go to the smallest (and thus least buggy friendly) cafes, I could travel on the train to see family with just the baby in a sling and a backpack, and when he was tired I could walk and cuddle him to sleep. I am so grateful for babywearing my talipes baby and would recommend it to anyone. Can everyone use a sling with their talipes baby? (Editor) This isn’t a straightforwards question and the answer for every baby will be different! Talipes often co-exists with other problems which can make things more complicated, and it is always wise to seek the opinion of your trusted healthcare professional. It is worth being aware that many HCPs do not know a great deal about safe babywearing (as it is not taught in medical school!) and thus may not be aware of the truth about common myths, or the wide range of carriers around. Not all carriers are narrow based (which can indeed be unhelpful for known hip dysplasia.) Many babies with hip dysplasia will benefit from a good, well-fitting “ergonomically” designed carrier that helps to hold their legs in the optimal “spread squat” position that promotes healthy hip development. (You can read more about this in the Healthy Hips article.) 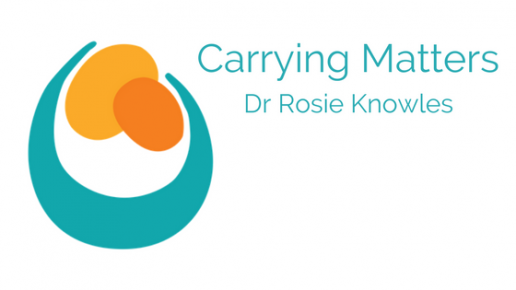 If you’re not sure what to do or if a carrier would be suitable, do speak to your local babywearing professional (they will always ask for more advice from the wider community if needed). It may help to take your planned carrier in to see your hospital team to show them what you would like to do. This will help them understand more about the carrier options available and they may become very willing to support you with this new knowledge. You may opt not to use a carrier in the early months if the situation is especially complex; but when baby is out of the cast/bar and boots, and if your doctor is happy, there will be a lot of choice available to you! For further info on the Ponseti method and how long each stage takes it’s best to ask your doctor, or look at the NHS website www.nhs.uk/conditions/club-foot/.